With the success of smoking the beef ribs, I decided that it was time to try out some other meats. I picked up some beef short ribs and brisket at the store and headed home to fire up the grill. The grill set up was the same, except the meat went directly on the grill grates this time. I consulted an assortment of grilling websites to get an estimate on how long to cook, if a mop sauce needed, and other tips for tender meat. When I cooked the ribs the first time, I split the cooking between the grill and the oven. For these short ribs, I only used the grill. I did finish off the brisket in the oven with some onions. The cook time is 4 hours plus, so I got everything set up and then mowed the lawn (keeping an eye on the grill). I had more time to spare, so I made egg salad for the week's lunch and chopped up all the veggies we had to save time during the week. For the meats, I used the same coffee rub that I had leftover. I put on the rub and refrigerated the meat for about an hour before cooking. You could leave it overnight for even more flavor. Here's a summary of the two different meals. Almost every grocery store carries beef short ribs now. They are often on sale and make a nice hearty meal. They come about 4-5 per pack - perfect for two people. These went down directly on the grill rack (not over the heat). They cooked for about 3 hours, flipping about halfway, until the meat shrinks up from the bone. I served the short ribs with couscous and was too lazy to make a vegetable. I did use fruit in the dessert (I'll post that at the end). 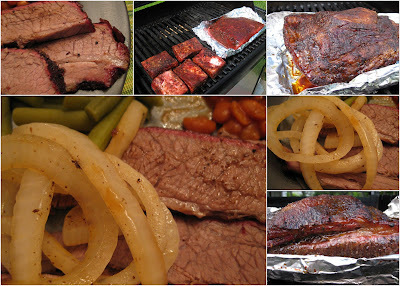 I love brisket - it is one of my favorite things to cook. Most of my recipes involve searing the meat and then putting it in the oven for 2-3 hours until its done. What could be easier? Smoking on the grill was just as easy. After about 2 hours I basted with the mop sauce and flipped it over. I basted every 45 minutes or so for another 2ish hours. To finish it off, I put it in the oven in a covered roasting pan filled with one bottle of Newcastle beer (to keep some moisture in there). I added some sweet vidalia onions and let it cook for another our. Since we weren't planning to have it that night, I let it cool and then put it in the fridge. Quick note - the cook time is about 1 hour per pound of brisket. We had a 4 pound brisket. On the day we wanted to eat it, I put it back in the oven for 2 hours so it would get even more tender. We sliced it and served it with some canned green beans (I had a craving for them) and some good old canned baked beans. It was a definite comfort meal. My mouth is watering just thinking about it! This was one of those meals that called for dessert. I had some cherry pie filling and canned pineapple in the pantry and decided to make a semi-upside down cake. It was delicious - I had a hard time not eating the entire cake! You can either flip the cake over onto a plate, or just cut slices and scoop it out. I'm off to the kitchen to get a piece right now! !